Less than 30 miles from the City of La Canada off of Hwy. 2, and at an elevation of just over 5,200 ft., Chilao is a great escape for Angelenos from the summer heat, suburban winter doldrums, and general hustle and bustle of, well, LA. 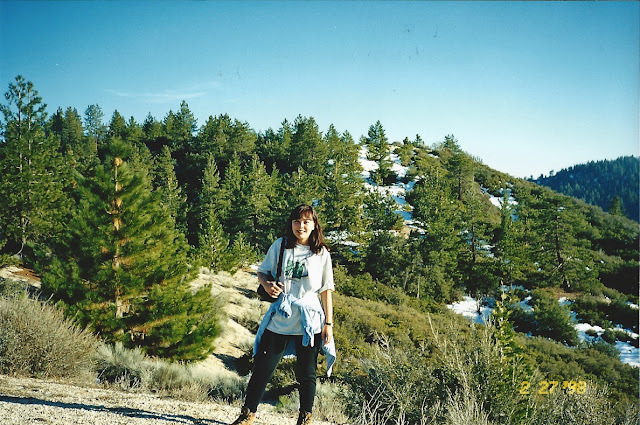 We've visited the area a few times over the past 15 years, usually on a day trip to the well-appointed visitor center, but we've also had occasion to camp at the nearby Little Pines campground and hike a short stretch of the Silver Moccasin Trail. 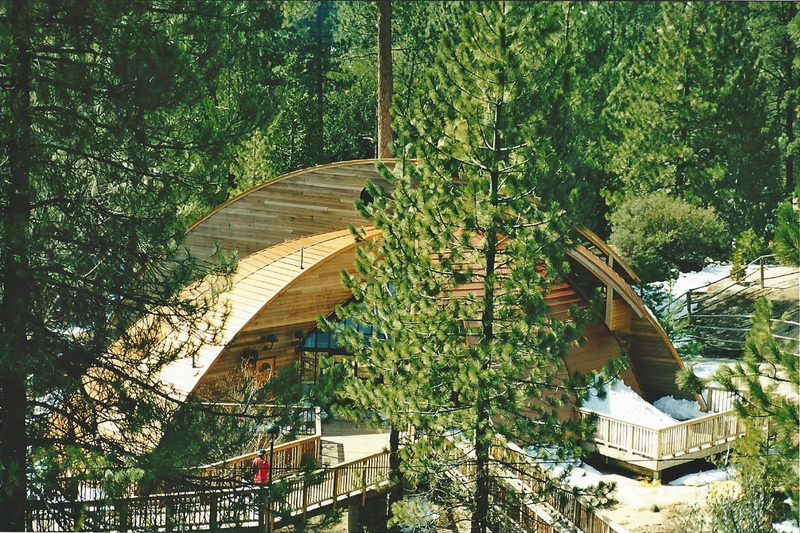 The visitor center itself is worth a visit, as the structure is both functional, yet architecturally unique and beautifully blended into its forest environs. I don't know or remember much about its construction, history, or materials (I believe it has a copper roof), but will update this post if I come across more info. 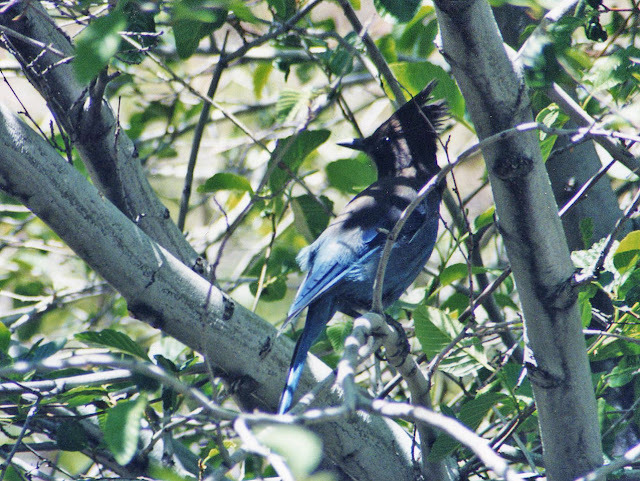 Great birdwatching up here (many species of woodpeckers) in a tranquil setting of pines and manzanitas. NOTE: Unfortunately, the devastating 2009 Station Fire may have prompted closures of the visitor center and/or some of the campsites. Be sure to check with the Forest Service district office for the latest conditions before heading out. 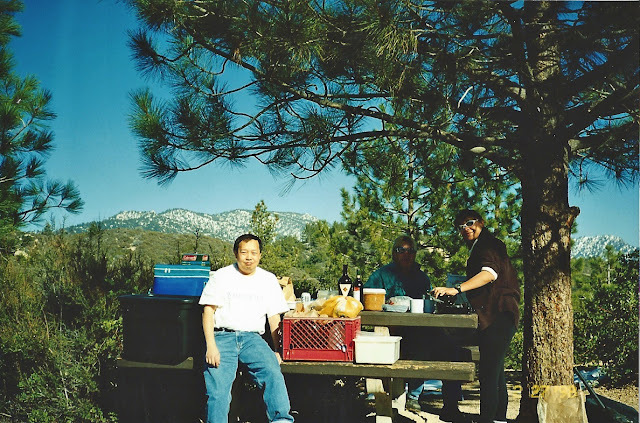 2/27/98 Gil, Chuck & Elaine, setting up the camp grub. 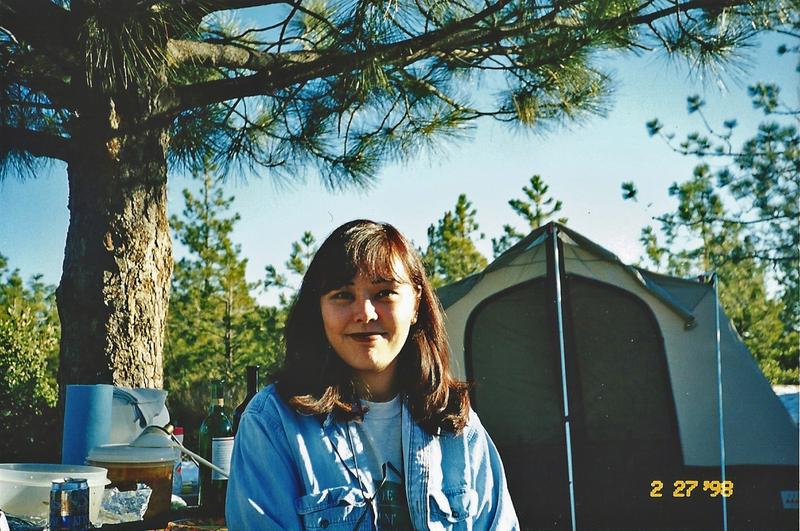 Little Pines campground, Chilao. 2/27/98 Settling into a cold evening. Gil & Chuck at the campfire. 2/28/98 EE, me & Gil. Silver Moccasin Trail. 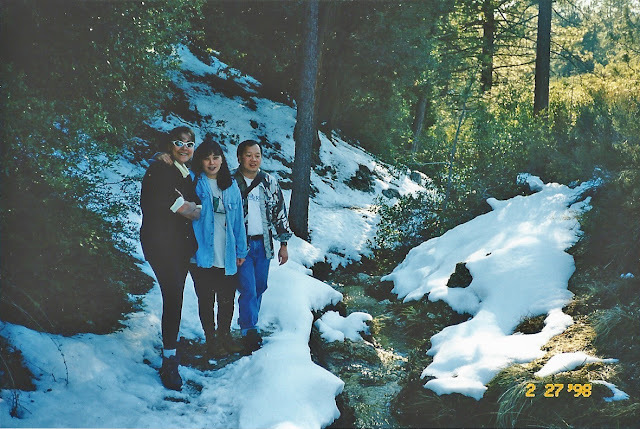 2/28/98 Me, EE & Chuck. 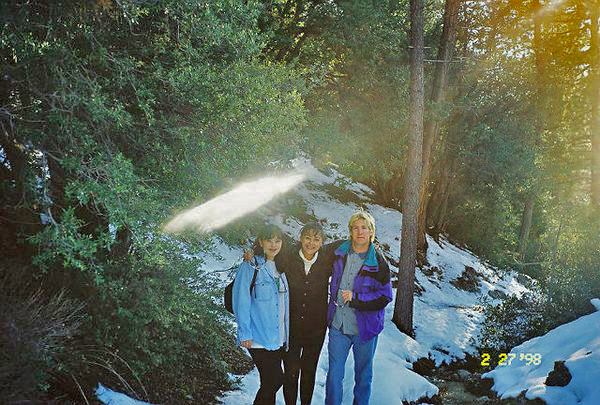 Silver Moccasin Trail. 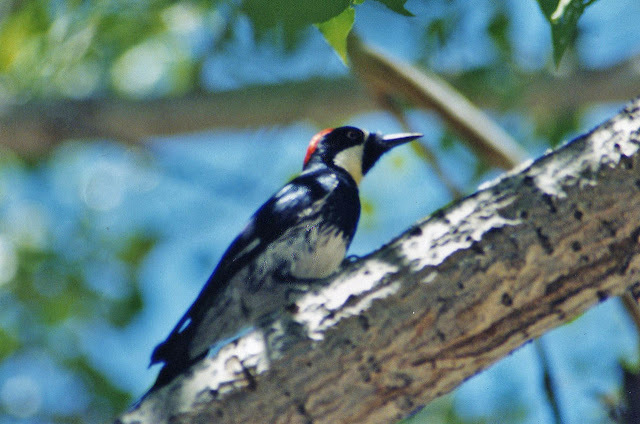 6/15/02 Acorn Woodpecker (Melanerpes formicivorus). Chilao visitor center. 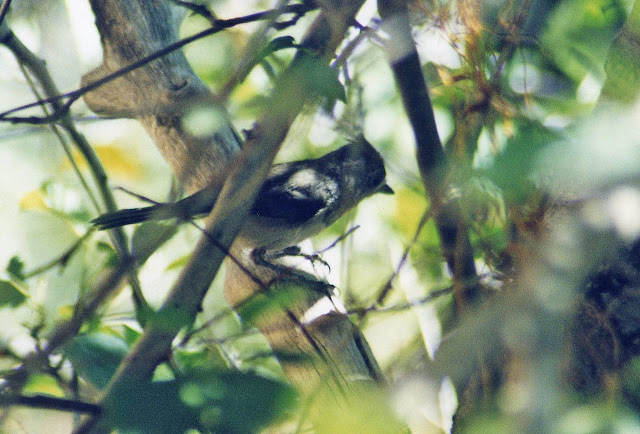 7/14/02 Oak Titmouse (Baeolophus inornatus). Chilao visitor center. 6/15/02 Steller's Jay (Cyanocitta stelleri). Chilao visitor center. Directions: From the 210 Fwy., exit State Hwy. 2 (Angeles Crest Hwy.) and go east 27 miles to the sign for the Chilao campground turnoff on the left. The visitor center is 1.5 miles north of the campground. Visitor Center: Exhibits, tours, programs, birdwatching & trails at the visitor center. Flush toilets & potable water. Trails: The Silver Moccasin trail is about 0.5 mile on the paved road past the visitor center. About a 2 mile round trip to Horse Flats and a more strenuous 6 miles round trip to Mt. Hillyer. Check with the visitor center regarding other hiking trails. Adventure pass is required to park at all trailheads. Be aware of bears. 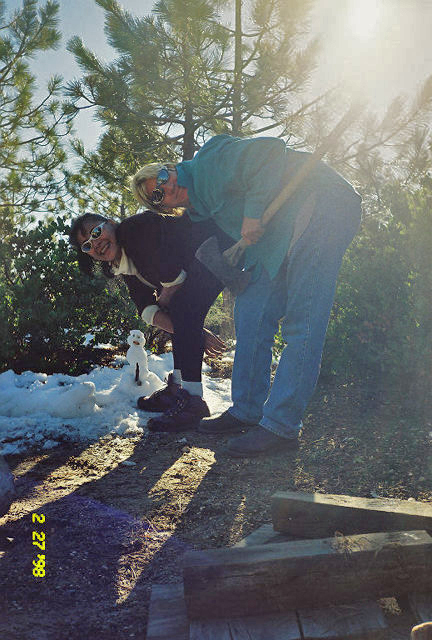 Fees/Camping: No admission fees at visitor center. Camping fees $12.00 per night. 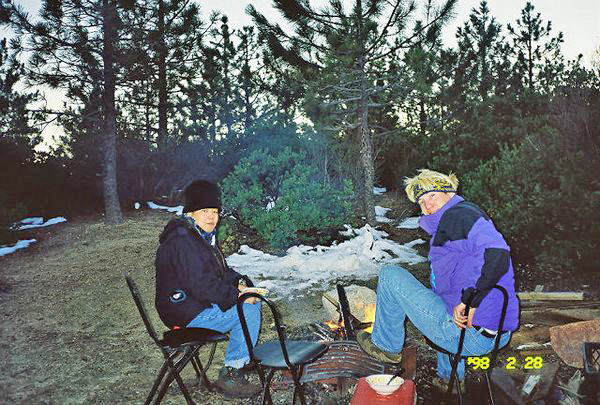 There are 83 sites in 3 camping loops: Little Pine, Manzanita, and Meadow. Vault toilets, tables & fire rings. Sites are subject to winter closure from mid-November to the end of March.